Good morning. 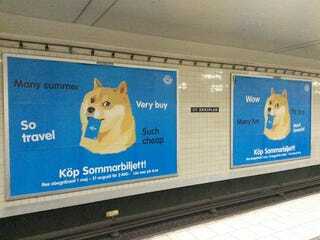 Here's Doge at a subway terminal. I got this from a tweet that was retweeted to me. To avoid the drama llama I won't post the tweet or say who it was from. What I can tell is it's at a subway stop in Stockholm, Sweden. I got that off Four Square. I just thought it was funny and would be a fun way to kick off the Friday. Have a good morning everyone.